​A kid-friendly giant painting (35' x 6') I created for outdoor installation commissioned by Redmond Town Center, and facilitated by VALA Eastside, incorporating imaginary creatures dreamed up by kids aged 1-11. Dimensions: 35 feet wide x 6 feet high. A neighborhood art installation based on my painting 'Contemplation, In Yellow'. Located at the intersection of 122nd and Ambaum. 'The Bumble-Bee Brigade' - Utility Box Wrap, Kent WA. An art installation to spruce up a neighborhood, using a design based on my oil painting, 'The Great Escape'. Located on the Interurban Trail near the South Kent Park and Ride. 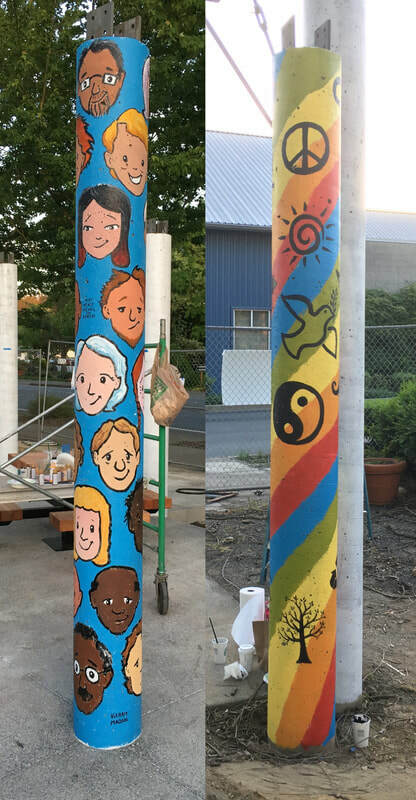 'PEACE POLES' - Pole Murals, DeYoung Park, Woodinville WA. Part of a larger installation featuring a dozen artists, invited to paint poles as part of the Rotary Club's 'peace on earth' program. Individual poles were sponsored by local businesses and families. The theme for the pole on the left is 'Diversity, Community, Inclusion'. The theme for the pole on the right is 'Universal Peace' - the five colored stripes are derived from the five most common colors on world flags and the symbols are universal symbols of peace and harmony. This is a permanent installation located at the DeYoung Park in Woodinville WA. Each pole is 10' high. 'Dancing with the Stairs' - Staircase Mural, Everett WA. 2016. A permanent installation created for The Dance School (Everett, WA). 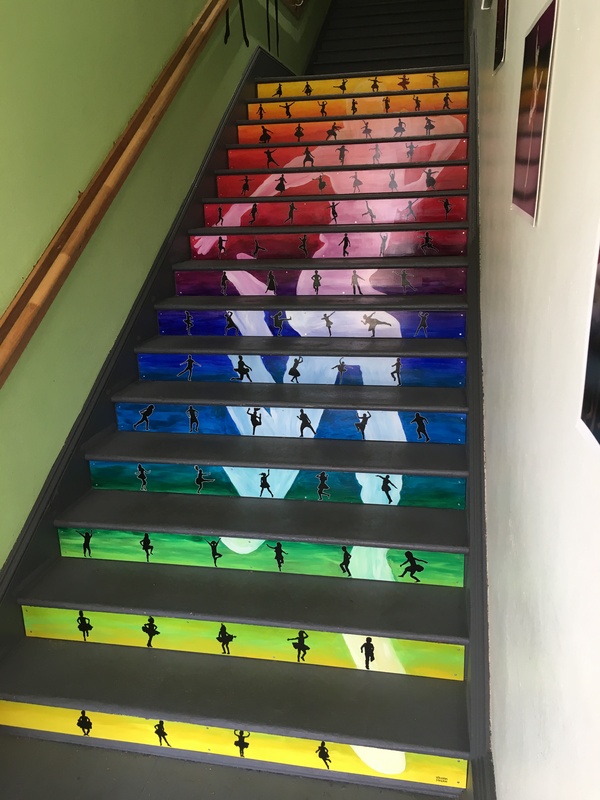 The mural comprises of 15 panels, each featuring school students engaged in a particular dance style, progressing from beginners at the bottom to the very advanced at the top. The panels are united by a central figure of one of the school's teachers. 'Moons' - Utility Box Wrap, Issaquah WA. 2016. An art installation to spruce up a neighborhood, using a design based on my oil painting, 'Night of the Mystic Moons'. 'Mini-Murals' - Seattle Art Interruptions 2016 Seattle WA. A temporary installation to activate a two-mile stretch of pedestrian Greenway in Seattle's Rainier Valley, featuring over 20 whimsical mini-murals installed behind street traffic signs, infusing the neighborhoods with a sense of discovery, surprise and humor. Duration: Originally scheduled for a 3 month run, this installation has been (for now) extended indefinitely due to it's popularity with the local community. 'Celebration' - A mural created for Tacoma Spaceworks May 2015. This 80' long mural celebrates three things that, imho, make us quintessentially human: 1. Our universal love for music and dance; 2. Our insatiable thirst to learn, discover, build (which leads to things like Robots); and 3. Our ability to smile at images like this. Dimensions: 80 feet long x 10 feet high. Located in Downtown Tacoma, near the museums. Directions to the site. A temporary art-piano installation for the King County Pianos in the Parks program, on display publicly for one month. ​A temporary art-piano installation I created for the City of Auburn for their annual summer piano program, on display for a month.